As previously indicated I didn’t do a lot over the course of my two rest days in Tarifa, however that was the point I suppose; it was lovely to just laze around, read a book, catch-up on some washing, and not have to pedal too far. Tarifa is famed for its consistent wind, making it the ideal place for wind or kite surfing. Of course over the two days I was there the wind dropped, so there was little to see in the way of surfing action; typical, and takes me back to a holiday in Nidri years ago when we were christened the ‘No Wind Team’ for exactly the same reason. I enjoyed a couple of good meals in Tarifa itself, cycling the 2km to town each afternoon to explore and feed; some nice Tapas and admittedly a burger, but it had salad with it! Tarifa is a lovely small town, and somewhere I felt immediately at home in, with a relaxed atmosphere, narrow streets to explore, and lots of little shops and restaurants. If you’re not being completely lazy like me, there are plenty of activities to partake of besides water-sports, including whale watching, trips lover to Morocco, diving and going up in a microlight. I was content to eat, sleep and read a book or two, occasionally taking a break from such strenuous activity to chat to fellow campers, who weren’t impressed with the lack wind, or sit in the great little campsite bar to update my blog over a ceveza or two. I did a bit of thinking about Stage 2 of my tour too, and the route I want to take. I’ve decided to skip Morocco this time around, for a number of reasons. I think it would be a better to tour with someone else, from security and assurance point of view, and it would be prove more worthwhile to plan it in more detail, and spend at least a couple of weeks exploring; one for the future. I want to be back in France and in the Marseille area by the middle of August, so I’m going to head on up the coast of Spain, enjoying what the Mediterranean has to offer. One warning if you’re visiting Tarifa; bring some Mosquito spray, they’re voracious! I’ll definitely be back in future. Stage 2 is underway! It felt strange to be cycling East, or North East, after so longer heading South and West. I felt recharged after my two days off; I considered taking another day off but realised I’d just be bored, and if I was going to learn who to kite surf I’d need at least another 2 weeks, probably more like 2 months in my case. After a slightly late start, as it took me ages to pack and clean the bird muck off my tent (I’d camped under a sparrow roost), I pedalled past Tarifa and up a challenging climb to get over the mountains to Algeciras; over a 1000 foot and quite steep, however not too bad on fresh legs, and got waves and shouts of encouragement from several other cyclists out and about. After a rest at the viewpoint, I finished getting over the mountains and enjoyed a long descent down to Algeciras. There’s not much to say about Algeciras; it’s a big port and working town, where you can get a ferry over to Ceuta or Tangiers. I pedalled straight through it, trying to find the route to Gibraltar, which isn’t signposted until you get close, I imagine deliberately by the Spanish. I had to use bits of a couple of Autovias before joining quieter roads to the border, where it got busy again, with large queues of traffic waiting to cross in both directions. I had to use my passport to cross the border into Gibraltar, for the first time since arriving in Norway two and a half months ago, kinda ironic. Saying that I only waved it at border control as I cycled straight through, then across the runway into Gibraltar town itself. I was spotted on a webcam by the stalkers from home as I set foot on UK soil again, good work! Right up until Algeciras I’d been unsure as to whether I’d bother nipping over the border to Gibraltar or not, but as the road seemed to naturally take me in that direction I thought I may as well. It was quite strange being back in UK territory, however thankfully they still drive on the right so I didn’t get confused. Little things like the traffic lights being the same as in the UK, along with red buses, and signs for things in £’s were all bizarre to see. I had a quick wander around Gibraltar, but as normal it’s a bit tricky sightseeing with a heavy bike; you can’t really just leave it somewhere with all your luggage on, even if the bike itself is locked. It was nice walking through the main shopping area, listening to lots of people speaking English, and feeling like I was briefly back in the UK. I made my way out of Gibraltar via the old city wall, scene of many a battle versus the Spanish. Today the noise of cannon fire was replaced by the wonderful melody being played by a guitarist busking in the tunnel through the thick walls. I stopped to listen and had a quick chat; he was having a hard day, with people stopping to listen but not sparing any coins, so I gave him a couple of euros. Despite being a very talented musician the busker couldn’t find any work, and was having a hard time of it, so i was happy to pay for a tune. After Gibraltar, and a cold drink stop at a garage, it was on to Estepona. The temperature soared in the afternoon, to over 40 degrees Celsius, and that coupled with some fairly big hills and a few stints on Autovias made it tough going. I passed a police road block in the hills near Gibraltar which was pretty serious looking. They had guns at the ready and spiked chains on standby to throw across the road should anyone try to make a break for it; they didn’t seem particularly interested in me, so I figured it was allowed to cycle on this particular auto, but were obviously looking for someone. I took a somewhat circuitous route to avoid some of the busier autovias, even though I’m allowed to cycle on at least some of them, but made it to Estepona and then on to my campsite for the night without succumbing to heat stroke; drank a lot of water though. Thankfully the beaches all have water fountains next to them so I could refill my water bottles. After 114km I was happy to reach Camping Parque Tropical, and check-in for the night, even if the campsite was expensive at €20. I have a feeling a lot of the campsites along the coast are going to be more expensive, it being the high season now, and a more touristy area. One thing that could be improved upon at many Spanish campsites; friendlier receptionists that don’t make you feel like you’re putting them out when you turn up. It makes a real difference when you arrive tired after a hard day in the saddle, and are greeted by a smiling face that wants to help, and is even just slightly interested in what you’re doing. I’m definitely more likely to remember and return to the friendlier ones; maybe they should take some tips from the pilgrim hostels, that without fail always offer a warm greeting. Despite the lack of welcome I spent a pleasant evening and night at Camping Parque Tropical, buying some dinner from the onsite shop (pasta) and relaxing for the night. It was extremely warm again so I didn’t feel like doing a lot, so had an early-ish night, looking forward to carrying on up the coast alongside the Mediterranean tomorrow. Alhough I couldn’t catch them on camera the campsite kittens were fun to watch, going mad chasing each other round as night fell. 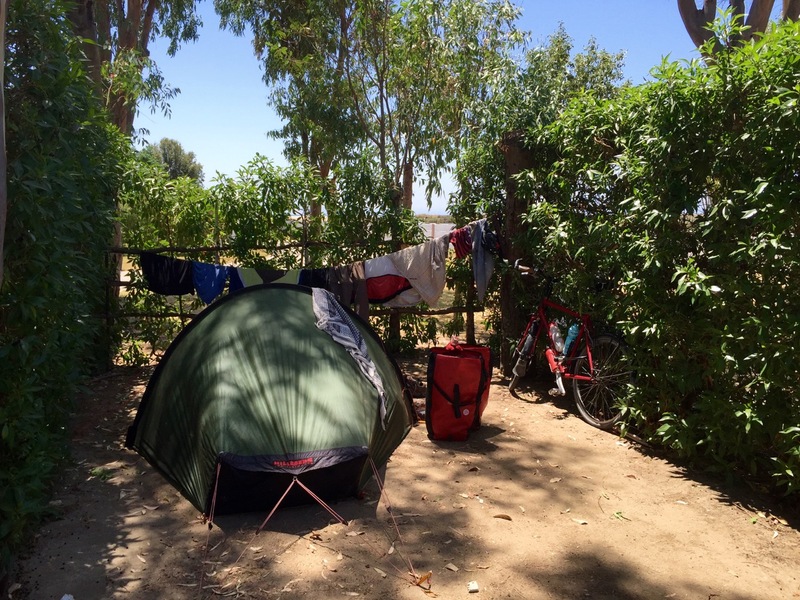 This entry was posted in Self Propelled 2015, Spain and tagged Adventure, Bicycle Touring, Bike, Charity, Countryside, Cycle Touring, Europe, Expedition, Gibraltar, photos, Self Propelled 2015, Spain, Tarifa on July 23, 2015 by SelfPropelled.